Before you hit the tanning bed you might want to consider an indoor tanning lotion. Bronzers, accelerators, pigment boosters, antioxidants, nourishing moisturizers… tanning lotions have so much to offer. You love tanning and using a lotion shows just how much you love your skin. 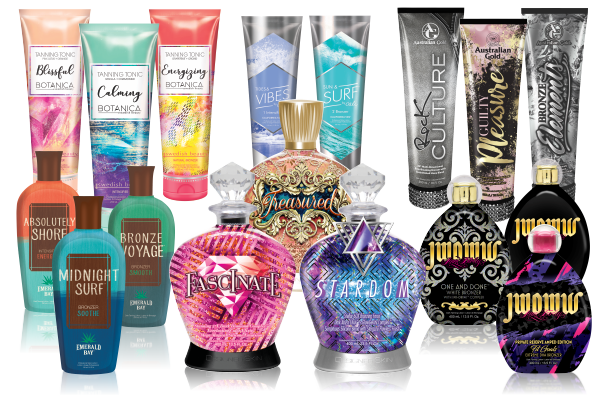 Our huge inventory of indoor tanning lotions is simply unrivaled. Quality of product, pricing, variety and staff knowledge cannot be beat. We carry the top brands in the tanning industry: Australian Gold, Designer Skin, California Tan, JWOWW and Swedish Beauty. From there we choose the best of the best to place on our shelves; always searching for the latest and greatest from each brand to offer you. Nowhere will you find better products at better prices. Have questions? Come right in and ask any of our salon associates. Whatever your need, whatever your budget, we have the perfect lotion, potion or bronzing trick waiting for you! Join our Tanners Club and you could start enjoying up to 40% OFF all suggested retail prices TODAY!